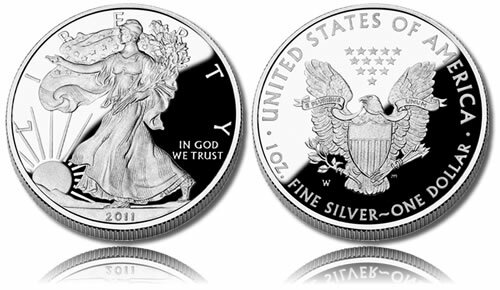 The 2011 American Silver Eagle Proof Coin continues a series of coins that debuted in 1986 as the collector grade version of the similar Bullion Silver Eagles. The bullion coins were authorized as part of the Liberty Coin Act (Public Law 99-61). The proof launched on June 30, 2011 for $59.95. In a rare event, the United States Mint raised its price by $8.50 to $68.45 on August 29, 2011. This was, in part, due to higher silver prices, but also to make room for the collector uncirculated version and a special 5-coin 25th Anniversary American Silver Eagle Set. Proof American Eagles have appeared annually since 1986 with the exception of one year. The Mint was forced to cancel their production in 2009 as it diverted all available silver blank planchets to production of the bullion Eagles. Investors were purchasing the bullion coins in record demand. Proof Silver Eagles have three different values associated with them. First, each has a legal tender face value of $1 which means that the United States government considers this a coin that could be used for commerce with a value of $1. Second, each is struck from one ounce of .999 fine silver. That composition means that each coin will always have an intrinsic melt value approximately equal to the current market value of that ounce of silver. Third, since the United States Mint strikes them at different quantities and with a collector finish, the coins have numismatic value. This is the price that the coin is worth to another coin collector based on its rarity and condition. The Mint takes this into account even when it initially sells the strikes to the public. A total price of approximately double the current market value of the silver in each piece is not uncommon for the coins when first released. The 2010 strikes are a perfect example, the Mint charged $45.95 per coin whereas silver in the first nine months of the year averaged only a bit over $22 an ounce. Enhancing the numismatic value even more are coins that have been slabbed and graded highly by an independent third party grading service. Millions of the Proof Silver Eagles have been sold by the Mint since first introduced in 1986. However, the only single year to break the million coin mark remains the inaugural 1986 strikes of which 1,446,778 were sold. Adolph A. Weinman’s depiction of "Walking Liberty" is shown on the obverse of all of the Silver American Eagles. The design was first used on the Walking Liberty Half Dollar which appeared from 1916-1947 and is considered one of the most beautiful designs to ever be struck on a coin of the United States. Surrounding the design will be the inscriptions of LIBERTY, IN GOD WE TRUST and the year of 2011. John Mercanti designed the reverse which shows a heraldic eagle with shield along with the inscriptions of E PLURIBUS UNUM, UNITED STATES OF AMERICA, 1 OZ. FINE SILVER and ONE DOLLAR.